These and other articles on the Firearms History Blog will give you many interesting hours of reading — Enjoy! And while you’re cruising the web, definitely check out Roy’s own RVB Precision website. 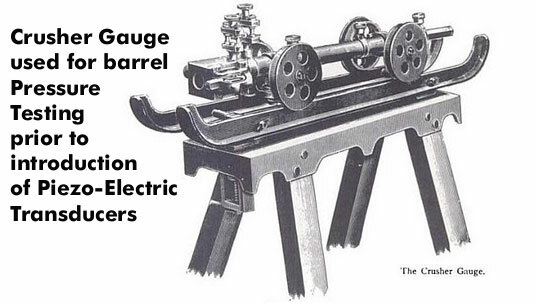 It features many interesting DIY gun and reloading projects, such as Fabricating a 17 HMR Bore Guide, Building a Swivel-Top Varminting Bench, and Fabricating a Unertl-type Scope Mount. Share the post "Great Resource for Firearms History and Technical Information"
Many of our readers know Joel Kendrick, one of America’s top mid-range shooters. Joel is a two-time IBS 600-yard Shooter of the Year, and we have featured Joel’s match-winning 6×44 as one of our Guns of the Week. Joel now works with MMi-Trutec, specializing in the salt-bath nitriding process. This is a surface-hardening procedure for steel that creates a super-hard, low friction layer for the top 10-20 microns of the metal. Barrels treated with salt-bath-nitriding show much improved wear resistance and reduced friction. 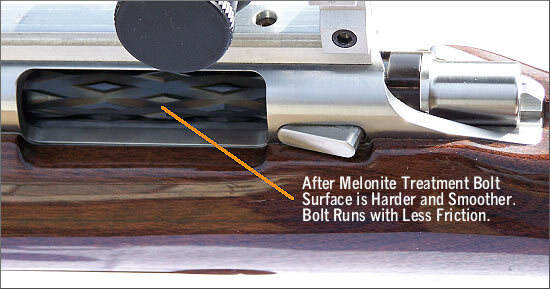 For match rifles, varmint rifles, and hunting rifles, the most significant benefits of salt-bath nitriding are enhanced barrel life, and easier cleaning. 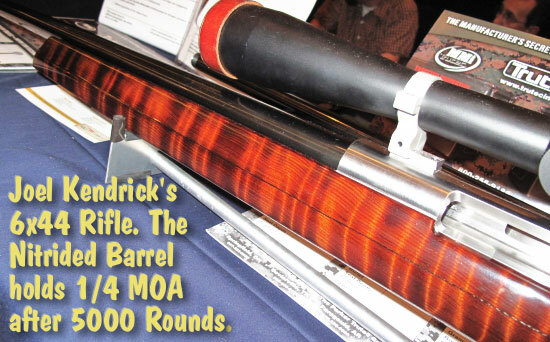 Joel’s own F-Class rifle has a nitrided stainless barrel with over 5000 rounds — and it still holds 1/4 MOA at 100 yards. 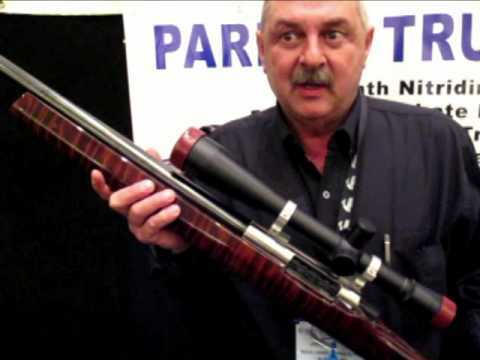 Other well-known shooters, such as John Whidden, have observed that nitrided barrels can shoot longer strings of fire between cleanings, with no reduction of accuracy. What is the cost of nitriding? As Joel explains in the video below, nitriding a single barrel costs $60.00, but there is a minimum first-time lot charge of $200.00. If you submit multiple barrels at the same time, the price per barrel can be reduced significantly. For more info, visit the MMI-Trutec website or contact Joel Kendrick by phone (704) 616-6442, or via email: joelkndrck [at] aol.com . Is there a downside to nitriding? First, the nitriding process results in a BLACK matte or satin finish. If you like the natural silver finish of stainless steel, you shouldn’t nitride your barrel. Second, and most importantly, the salt-bath-nitriding process creates a surface so hard that you can NOT re-cut the chamber with normal reaming tools. Therefore, before nitriding, the barrel must be finished chambered. Basically the barrel should be fully finished, crowned, chambered and headspaced before nitriding. NOTE: MMi Trutec CAN mask the crown during nitriding so that the barrel can be re-crowned at a later time. Share the post "SHOT Show Report: MMI-Trutec Salt-Bath Nitriding for Barrels"
Salt-bath nitrocarburizing by Melonite process has been applied in a wide range of industries throughout the world for many decades. It is used to improve the wear resistance, the fatigue strength, and corrosion resistance of components made from steel, cast iron, and sintered iron materials. 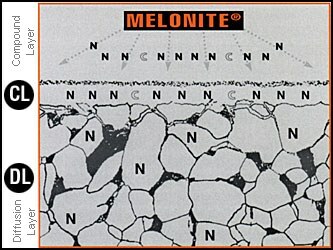 The Melonite process is used as an alternative to other surface engineering processes such as case hardening. Joel tells us: “I have been experimenting with this Melonite process for the last five years. I have been testing nitrocarburized barrels on my F-class and Long Range equipment since 2005 with good results. What will it cost? Joel expects Melonite treatment will cost under $100.00 per barrel, but the final pricing structure hasn’t been set yet. There will be volume discounts for gunsmiths and manufacturers. There are many potential applications of Melonite processing for shooters, Joel believes. In addition to barrels, bolts, actions, internal components, and even reloading equipment can be surface-hardened with the Melonite process. After processing, the surface compound layers formed consist of iron, nitrogen, carbon and oxygen. Due to its microstructure, the compound layer does not possess metallic properties. Depending on material used, the compound layer will have a Vickers hardness of about 800 to 1500 HV, and a layer depth of 10 to 20 micorons. That’s so hard that conventional reamers won’t work well on a Melonited surface, so the barrel must be chambered BEFORE Melonite processing. To learn more about the Melonite nitrocarburizing process and its application to shooting products, contact Joel Kendrick, joelkndrck [at] aol.com, or call (704) 616-6442. Share the post "Melonite Surface Treatment for Barrels, Bolts, and Actions"